The ocean chemistry along the West Coast of North America is changing rapidly because of global carbon dioxide emissions, and the governments of Oregon, California, Washington and British Columbia can take actions now to offset and mitigate the effects of these changes. That is the conclusion of a 20-member panel of leading West Coast ocean scientists, who presented a comprehensive report on Monday outlining a series of recommendations to address the increase in ocean acidification and hypoxia, or extremely low oxygen levels. Ocean acidification and hypoxia are distinct phenomena that trigger a wide range of effects on marine ecosystems. They frequently occur together and represent two important facets of global ocean changes that have important implications for Oregon’s coastal oceans. Enhance coastal ecosystems’ ability to adapt to changing ocean chemistry through better resource management, including marine reserves, adaptive breeding techniques for shellfish, and other methods. Chan said regional awareness of the impact of changing ocean chemistry started in Oregon. Some of the first impacts were seen about 15 years ago when the state began experiencing seasonal hypoxia, or low-oxygen water, leading to some marine organism die-offs. Then the oyster industry was confronted with high mortality rates of juvenile oysters because of increasingly acidified water. It turns out that Oregon was on the leading edge of a much larger problem. “It was a wakeup call for the region, which since has spread up and down the coast,” said Chan, an associate professor in the Department of Integrative Biology in OSU’s College of Science. California responded to this call, and in partnership with Oregon, Washington and British Columbia, convened a panel of scientific experts to provide advice on the issue. The panel worked with federal and state agencies, local organizations and higher education institutions to identify concerns about ocean acidification and hypoxia, then developed a series of recommendations and actions that can be taken today. 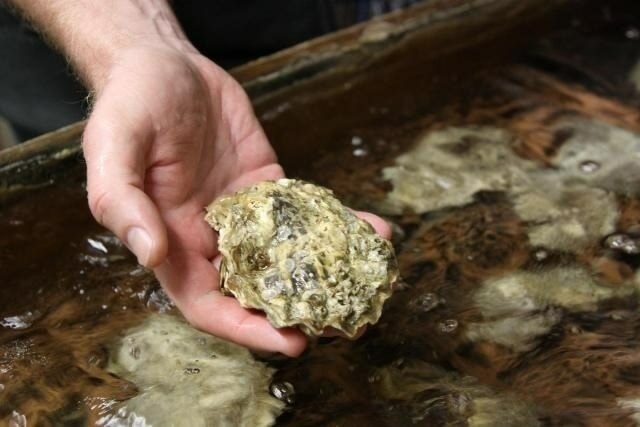 Barth said one such “listening post” has been the Whiskey Creek Shellfish Hatchery in Netarts Bay, Oregon, which was able to solve the die-off of juvenile oysters with the help of OSU scientists George Waldbusser and Burke Hales, who both served on the 20-member panel. Together, they determined that the ocean chemistry changed throughout the day and by taking in seawater in the afternoon, when photosynthesis peaked and CO2 levels were lower, juvenile oysters could survive. The West Coast is a hotspot for acidification because of coastal upwelling, which brings nutrient-rich, low-oxygen and high carbon dioxide water from deep in the water column to the surface near the coast. These nutrients fertilize the water column, trigger phytoplankton blooms that die and sink to the bottom, producing even more carbon dioxide and lowering oxygen further. “We’re just starting to see the impacts now, and we need to accelerate what we know about how increasingly acidified water will impact our ecosystems,” said panel member Waldo Wakefield, a research fisheries biologist with NOAA Fisheries in Newport and courtesy associate professor in OSU’s College of Earth, Ocean, and Atmospheric Sciences. Last year, OSU researchers completed the deployment of moorings, buoys and gliders as part of the Endurance Array – a component of the $386 million National Science Foundation-funded Ocean Observatories Initiative, created to address ocean issues including acidification. These and other ocean-monitoring efforts will be important to inform policy-makers about where to best focus their adaptation and mitigation strategies.